Paraffin, Vermont, is known the world over as home to the Grosholtz Candle Factory. But behind the sunny retail space bursting with overwhelming scents and homemade fudge, seventeen-year-old Poppy Palladino discovers something dark and unsettling: a back room filled with dozens of startlingly life-like wax sculptures, crafted by one very strange old lady. Poppy hightails it home only to be shocked when on of the figures - a teenage boy who doesn't seem to know what he is - jumps naked and screaming out of the trunk of her car. She tries to return him to the candle factory, but before she can, a fire destroys the mysterious workshop - and the old woman is nowhere to be seen. With the help of the wax boy, who answers to the name Dud, Poppy resolves to find out who was behind the fire. But in the course of her investigation, she discovers that things in Paraffin aren't always as they seem, that the Grosholtz Candle Factory isn't as pure as its reputation - and that some of the townspeople she's know her entire life may not be as human as they once were. In fact, they're starting to look a little...waxy. Can Poppy and Dud extinguish the evil that's taking hold of their town before it's too late? I'm going to try to blurb this - and I FULLY understand it is going to sound ridiculous - but stay with me. It shall all get explained in the end. Poppy is a theater geek with dreams of making it big on Broadway. Unfortunately for Poppy, an attempt at early fame on a reality TV talent show went horribly awry, leaving her the laughing stock of her small Vermont town - which just happens to be the home of Grosholtz Candle Factory (a.k.a. Yankee Candle on steroids). After an especially humiliating prank (pulled by Blake Bursaw, the Mayor's son, and Poppy's mortal enemy) involving a wax sculpture, Poppy is determined to get vengeance. 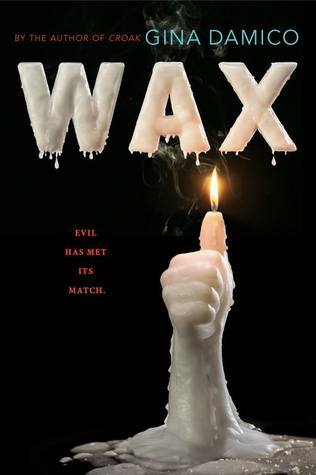 So she does what any self-respecting teenager would do...she breaks into the candle factory looking for evidence of Bursaw's evil schemes, but instead, stumbles upon a long forgotten workroom inhabited by a strange woman with a strange warning and giant, wax sculptures. That fateful afternoon sets off a series of mysterious, odd, downright weird happenings that include eternal flames (cue the Bangle's just for fun! ), a living wax boy named Dud, and some REALLY old candles. Maybe that didn't explain everything. But that's the point with Gina Damico. Her books always sound a little crazy, but once you're in them, you're on this wonderfully creative, unbelievable ride. Plus you get some amazing wit and excellent dialogue. Oh! And you always get a flawed yet fantastic protagonist. Poppy is a wee bit crazy, but she is fiercely determined and intelligent. While her musical talent might not match her drive, she has the support of the "Giddy Committee", fellow theater fanatics who form an amazing posse. Damico is my author spirit animal. She writes the books that I wish I had in me. They're a little off kilter, but wickedly amusing - as if she's just having fun writing. I Love! So Read! And Enjoy!